Arcadia hobby greenhouse kits offer superior quality frames to meet your local building codes for snow load and wind load specifications. These are not snap together kits made overseas, these are the same quality materials used in our Arcadia GlassHouse models. 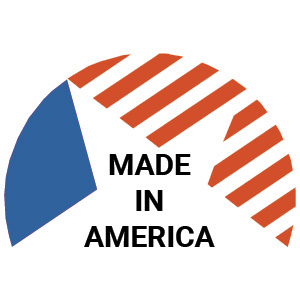 All components are pre-cut, pre-drilled and labeled for easy assembly. Installation instructions, construction drawings, and technical phone support are included with every kit. 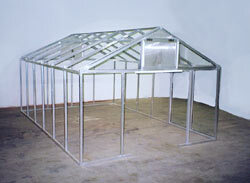 No matter what your size or requirements are, we can manufacture an Arcadia greenhouse kit for you. 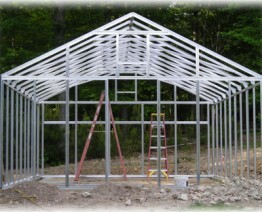 Free standing, attached, even-span or lean-to, we have the expertise to build a custom-quality greenhouse that you can install yourself. Our standard frame is built on 24 inch centers, so any width or length in two foot increments is standard, although it’s easy for us to customize the dimensions to fit your needs. 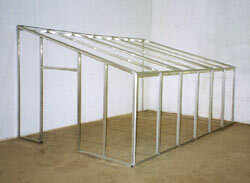 We have 6’-10” high sidewalls for glass to ground models, and 4’ high sidewalls for kneewall models. 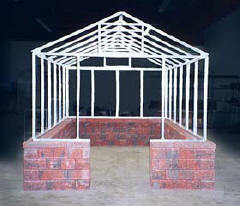 We use a 6/12 pitch roof for evenspan models and 3/12 pitch for standard lean-to models. Custom pitch roofs are available. Let our expert staff help you choose the best greenhouse kit for your home or garden. We share your passion for gardening and greenhouses. Just email or call – we are happy to help.